Ready to invest in new siding? Fantastic! Having trouble deciding what color is right for your home? You’re not alone. Today’s siding color options seem almost infinite. Pacific Home and Patio would like to share some recommendations for picking out the perfect hue for your home. Consider your house type. Do you have a Colonial, Victorian, or any other period home design? The architecture of these homes tend to look best when the siding color choice is a common color from the historical period. Consider nearby houses. What colors of siding are typical in your neighborhood? Do you want your home to blend in or to stand out? Do you want your house to look larger or smaller? Using a dark color will make your home look smaller. Light colors tend to make a house look larger. Choosing more than 1 color is usually best for a two story house. Consider the features of your house. Don’t forget to take the color of your roof into account. You want to make sure that the roof complements the new siding color harmoniously. Also, check out the landscaping. Do the colors present in the natural surroundings of your home work well with the siding color you are contemplating? Remember the trim. Homes with well-coordinated trim and siding are especially attractive to the eye. The best way to complement the trim to the siding color is to use a color either few shades lighter or darker for the trim. If your siding is a dark color, choose a lighter trim. If your siding is a light color, be sure to use a darker color for the trim. One last thing to remember with your new siding project, no matter how amazing the color selection you make, you need to make sure that you choose a quality siding material for your investment. 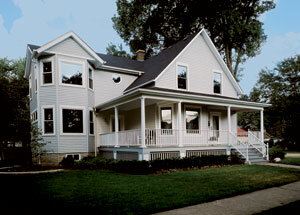 Cheap siding will not hold its color and is more susceptible to cracking and fading. Pacific Home and Patio will work with our customers in Boise, Meridian, Eagle, Southwest Idaho, Ontario, Baker City, and Eastern Oregon to pick the best quality product for your home for your budget.